For me, it’s all about teaching dog-owners empathy with their pet. And I thought this was a subject which deserved deeper study. For years people have been exhorted to treat the dog in their home with suspicion. Mistrust. Seeing it as a foreign species that needed to be shouted at, possibly beaten, and at best cajoled into doing what they wanted their dog to do. So people still turn up at class thinking that’s what they ought to be doing. That the reason their dog is not complying with their every wish is because they’re too soft on them, babying them, anthropomorphising them. This leads to them doing and saying things which really run counter to their intuition. If you have a creature in your home, whether child or animal, you want to cosset it, cherish it, look after it, get a friendly response from it. This is especially the case for women, traditionally and emotionally the nurturers. So they’re already conflicted when they come to me for help! They’re trying to live up to this false model that they have to be the leader, show the dog who’s boss, put themselves in a higher position than the dog, all fostered by misguided (ok - just plain wrong) tv programs. The relief they show when told that they don’t have to do any of those things, that they can be natural around their companion dog, and they can indulge their feelings of warmth towards this creature, is palpable! And it’s often accompanied by huge sighs of relief and visible physical relaxation. They thought they were going to be castigated for not being hard enough, tough enough, for allowing the dog on the furniture and so on and so on. They transform when they are “given permission” to act as they naturally want to. Plenty of ideas in this free 8-lesson email course for really getting to understand your dog! I use a lot of analogies and stories - usually about people and their children or their colleagues or friends - to demonstrate how the dog feels, and how he thinks. I’m always giving people examples which they will readily understand and can translate to their relationship with their dog. This is one of the reasons my books have developed such a following. Yes, the dog is not a human being. But don’t you think he knows that? With no opposable thumbs he relies on us for so much in his life - from preparing his dinner to opening the door, lighting the fire, driving the car … He doesn’t need to be “kept in his place”! He’s only too aware of his place already. There are, of course, areas where the dog is not at all like us. People sometimes worry about dogs being jealous if the same treatment is not offered to all the family pets. You will give a different type of attention to a toddler, a 10-year-old, and a teen or adult. As long as they’re getting what they need, they don’t carp over what the other child is getting. In the same way, one child may be delighted with his Christmas present that cost only a few pounds, while his brother was given something appropriate for him that cost many more (there you are - I’m doing it again!). Your dog has no knowledge of comparative monetary value. But he does understand attention! And as long as you’re giving your different dogs attention, they’re happy. A simple example could be walking your puppy without your other dogs because he needs to learn about the world with you, while your older dogs may just want to run around sniffing and playing - too exciting for the pup - and your oldest dog will be happier lying in front of the fire and going on only occasional walks. We don’t have a problem with this kind of individualised care! 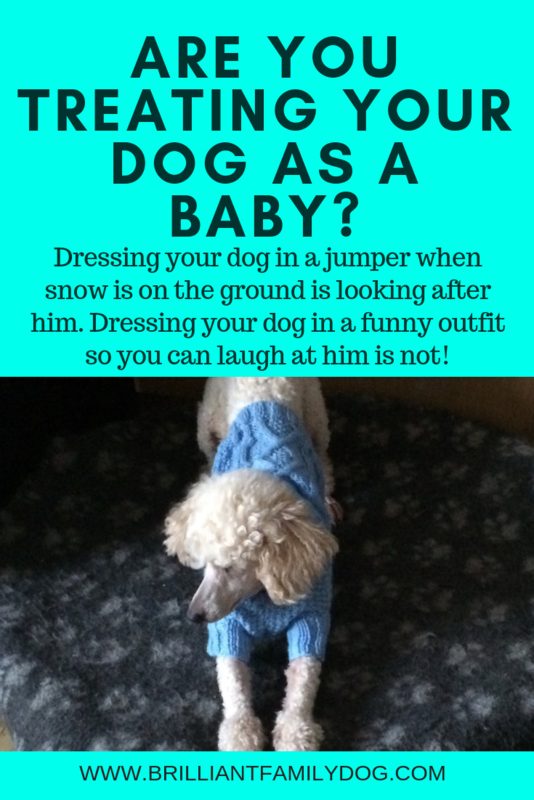 Another area - where anthropomorphism could go wrong - is in “dressing” your dog. Two of mine have thin coats and feel the cold. So when the weather is bad they wear a jumper or waterproof which makes them more comfortable and saves me dog-drying time. So those “cute” images of dogs clipped to look like a cartoon character, or wearing strange garb to cause amusement without a thought to their feelings and comfort, are completely counter to my aim of building empathy for the animal. The experts agree with me! It’s nice to know that I’m in good company with these ideas. This demonstrates that seeing your dog as a person, with her own thoughts and desires, means you’ll create a stronger bond and ultimately enjoy a better life with her. I’m pleased to see this is actually creeping onto the statute books of many civilised countries - that animals are sentient beings, not chattels. Further to this is the fact that not only do we think our dogs are like us and can therefore understand us, but they actually can understand us! Tests of canine language ability offer a new way of looking at dogs' mental skills. If a problem can't be solved by a 2- to 3-year-old child, then it is not likely that a dog can solve it either. Plenty of ideas in this free 8-lesson email course for learning to understand your dog! Tagged: anthropomorphism, dressing up dogs, dog behavior, dog behaviour, understanding your dog, dog vocabulary, can dogs understand words?